Hi everyone! You know how LONG I have waited for this day.. to have a teeny tiny itsy bitsy WALL OF SHIPLAP!! Well we have one! Its small but oh its still Shiplap! 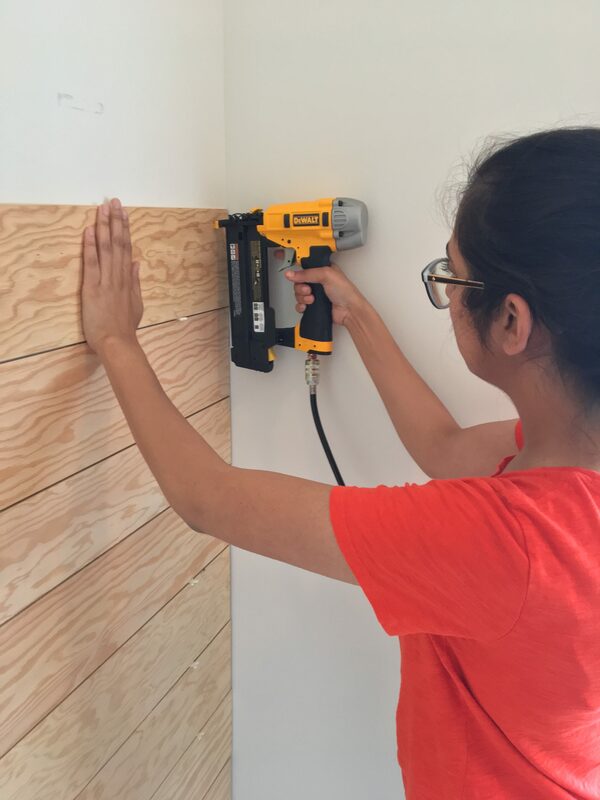 So I have a quick and easy DIY tutorial for you on how to make your own shiplap wall! 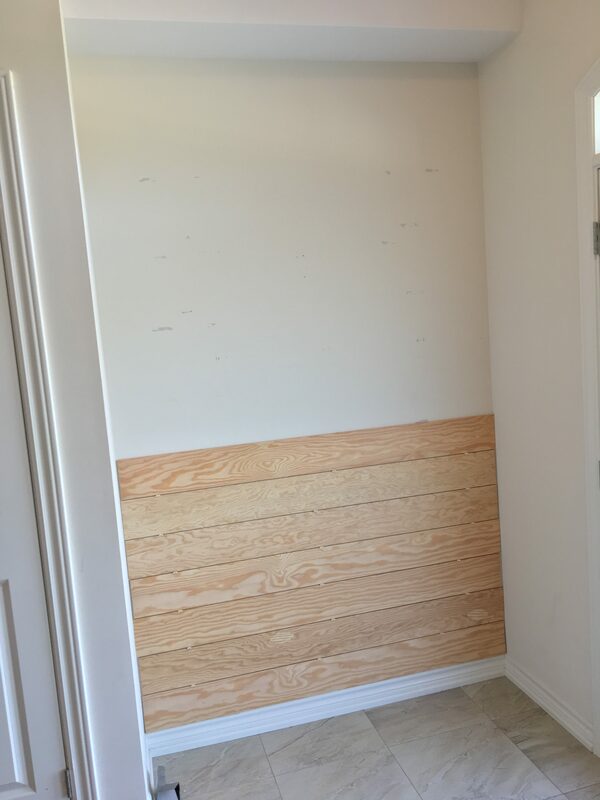 Shiplap Wood – We used Underlayment Plywood cut into 6 inch planks. 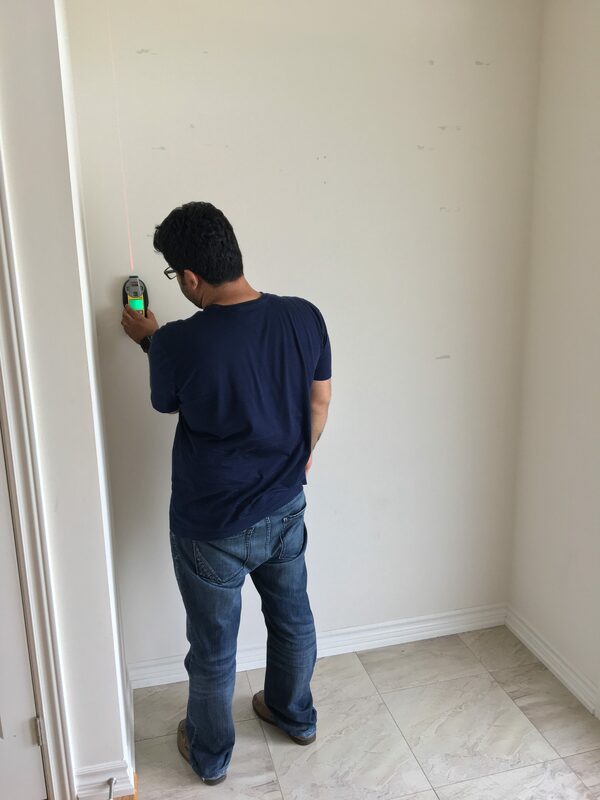 This is what the space looked like before – You have to remember, we live in a cookie cutter, builder grade home.. so the walls are not painted and its cute, but lacks character! Next, start nailing your planks on the wall. And then we worked our way to the top… truly the Dewalt Brad Nailer was a life saver! I mean, I don’t know what I have been doing with my DIY’s all my life using a hammer (GASP!) and nails and always hammering my fingers in the process. If you don’t own a Brad Nailer and are looking to purchase one, I highly recommend this one. It is incredibly easy to set up (again, yours truly learned how to do that in a jiffy!) and even easier to use! I have used it multiple times since then and cannot say enough positive things about it! Third, cover nails and sand! Once the wall was completed, I used spackle to cover the nails and let it dry. I also used some sand paper to quickly sand off any excess. 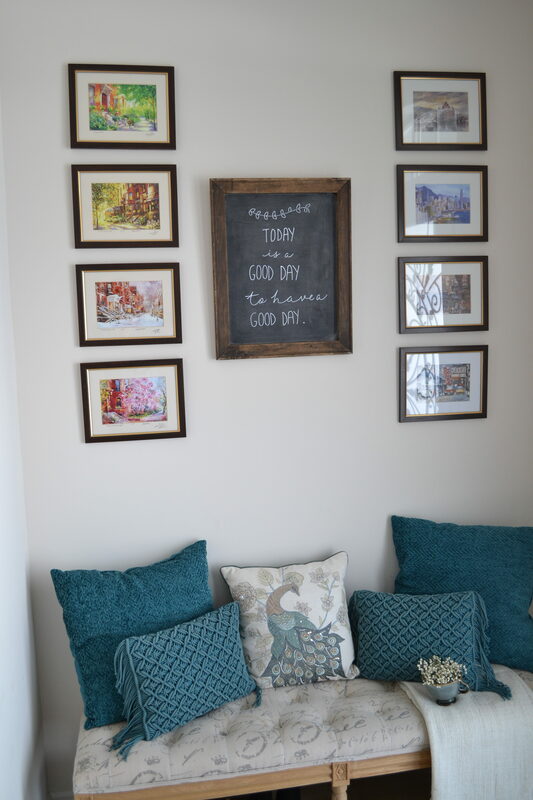 The next step is optional.. as I have seen walls both with and without it – corner trim. 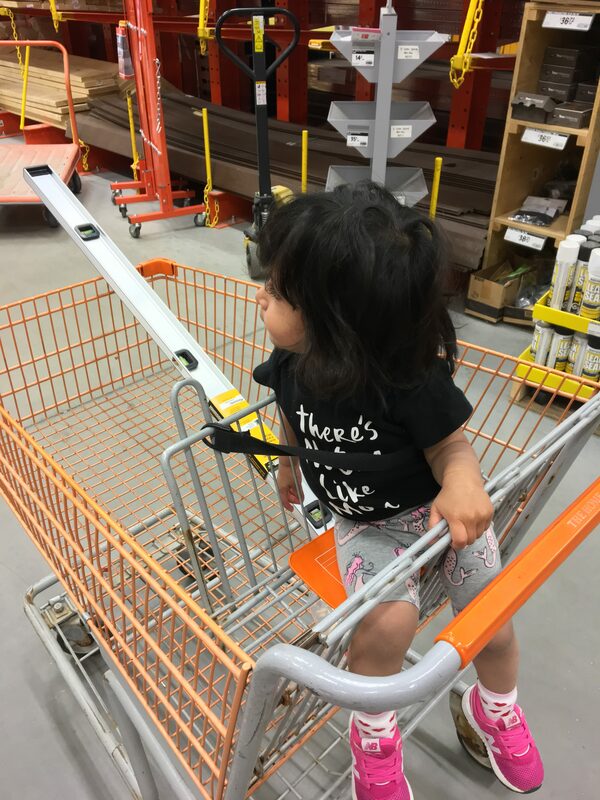 We had not planned to put this on, but because we went to home depot 10 times in the same day (hello, newbies here! ), we decided to get some trim and nail it in to “finish” off the little wall as this is really the ONLY shiplap wall. 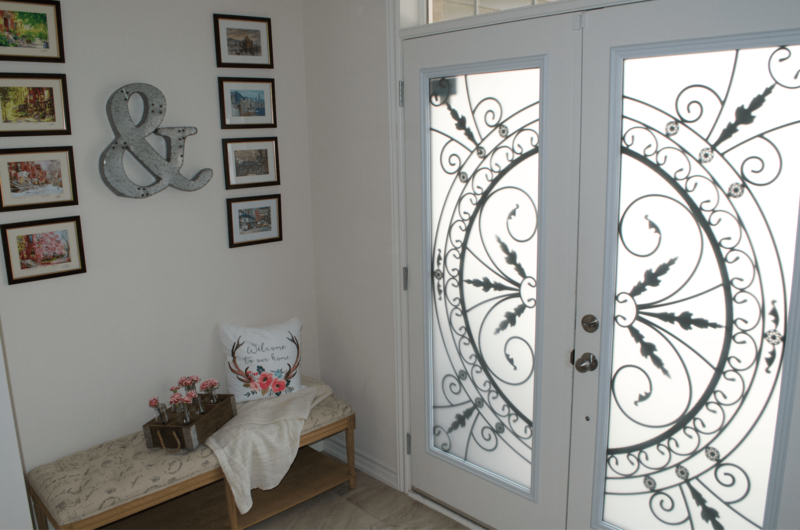 So we added some trim which cost us like $5! 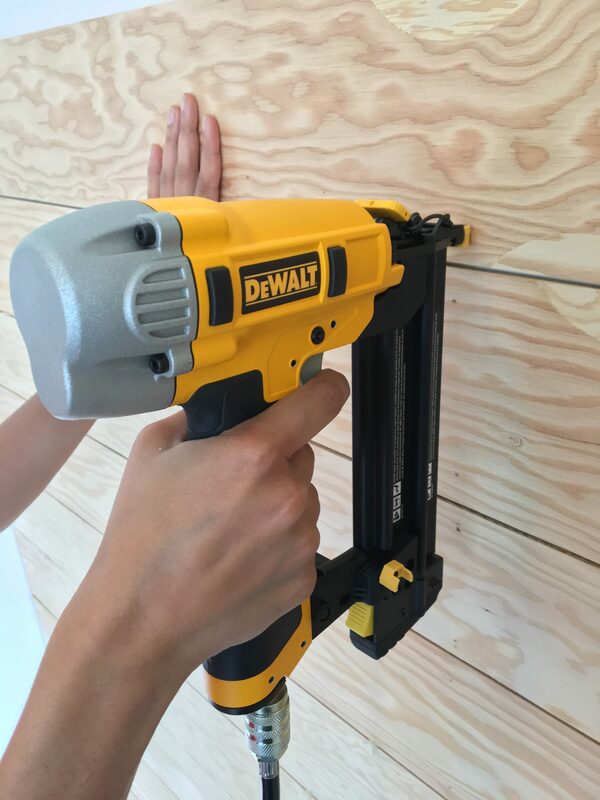 We cut it so size at home depot ourselves and put it along the length of the wall using.. you guessed it, our handy Dewalt Brad Nailer! Next, we painted the wall with Sherwin Williams Super Paint (paint and primer in one) in Alabaster, which is truly such a beautiful white! It is not cool or warm, but perfectly in the middle. 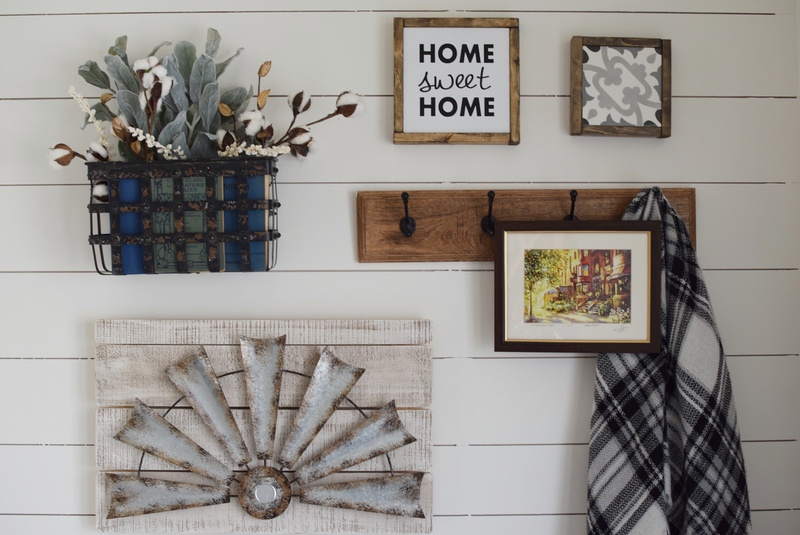 And bonus – it is Joanna Gaines favourite shiplap white – so I knew we could do no wrong! 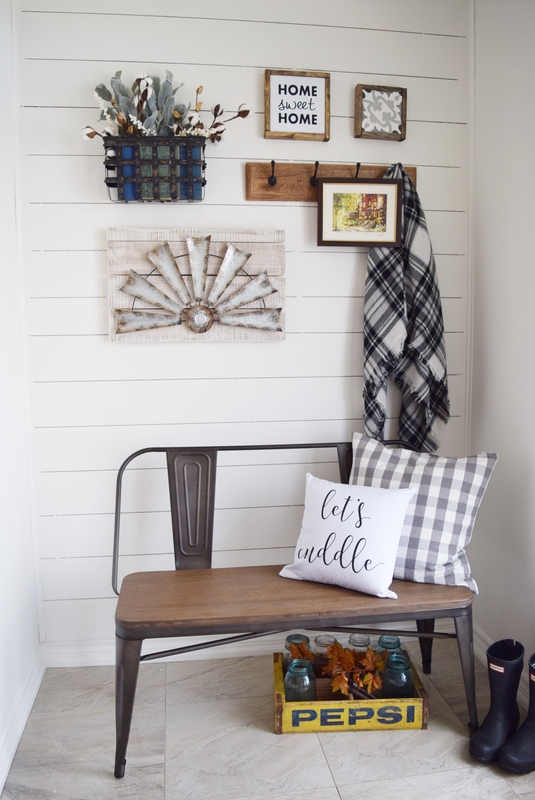 And here it is, the entryway nook, in all its farmhouse glory, all dressed up for fall – Truly #JoJoMadeMeDoIt!